Facilities management painters Manny Camargo, front, and Raul Morales touch up a windowsill on the fourth floor of the Forbes building yesterday afternoon. They have been taking off the lead paint, vacuuming and then repainting areas of the building that need it. At least a dozen employees in the Forbes building have complained about getting sick last Friday after paint fumes wafted through the building. The Agricultural Education office, which employs 30 staff and student employees, was among several offices on the building's first floor that closed when fumes from the paint entered the building. The oil-based paint was used Friday afternoon in the same courtyard where the air intakes for the building's ventilation system are located, said Carl Olsen, Forbes building monitor and entomology lecturer. Workers were still painting yesterday afternoon. On Friday afternoon, the paint fumes were measured at levels of 3,000 parts per million in the courtyard and 1,000 ppm within the building, which are higher than normal measurements, Olsen said. The human nose can detect an odor at 5 ppm. Because of the possible health risks involved with oil-based paints, the Environmental Protection Agency recommends that outdoor painting be scheduled when buildings are unoccupied. Susan McGinley, an agricultural communications specialist who works in the building, felt ill Friday afternoon at work, and a sudden headache and nausea soon followed. Another worker in the same office felt fine, but both women noticed a smell like rubber cement in the air. Down the hall, support systems analyst Robert Lanza also started feeling nauseated. By 4 p.m., he was asleep at home with a headache and stayed in bed until 6 a.m. Saturday. Lanza felt ill throughout the weekend, and he said he still was not feeling well yesterday. 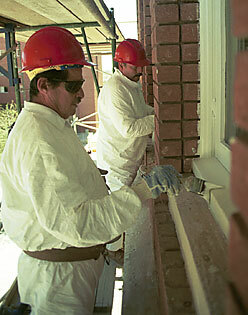 The employees attribute their symptoms to the ongoing painting project in the courtyard. The trim and windowsills of the building are getting new paint because large chunks of the old lead-based paint, which is poisonous when ingested, have come loose over the years. Workers have been using scrapers attached to hepa-filter vacuums and vacuuming the windowsills on both sides before and after old paint is removed, said Julia Rosen, health and safety officer for the department of risk management and safety. Most of the lead paint is scraped off, but a few chips really stuck on are painted over. The courtyard filled with scaffolding has been closed off while painters work. The plan was to paint the eaves of the building - one of few areas requiring oil-based paint - while some employees were away on spring vacation, Rosen said. Rosen, an industrial hygienist, said she was away from campus Friday afternoon and has not received any complaints about the odors in the building. But employees have been very vocal with their complaints of the odors, Olsen said. Still, he said finishing the project is worth the few inconveniences it may cause. "You'll have people who'll whine and cry, and if you get sick, you go home, and that's OK," Olsen said. In 1999, facilities workers found coliform bacteria in the water of the Forbes building. Coliform bacteria are found in the intestines of humans and animals and can cause illness if ingested. In that case and in this week's case, workers who feel ill may go home without losing any of their vacation time, Olsen said. The Agriculture building, which was later renamed the Forbes building after professor and scientist Robert H. Forbes, was built in 1915 and is on the National Register of Historic Places. Although the building is due for some renovation, Olsen said, money for building upkeep isn't always available. "This is something we've been wanting done for 10 years," said Randy Ryan, assistant director of the agricultural experiment station, who also works in and monitors the building.